Medfield Animal Shelter News: Harry is Enjoying the Boating Life! Brendan, now named Harry, was adopted the other day and we already received the nicest update on him. Sounds like he is going to have a very fun summer! We wanted you both to know that Harry is already a joyful addition to the household - we feel so lucky to have found him! He has charmed everyone he meets, and he's met a bunch of people in these last few days! 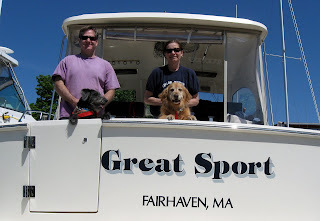 Here is a photo taken today, when we all went down to our marina in Fairhaven - Harry checked out the boat on which he'll spend much of the summer season with his new companion, Daisy. He will be visiting the Vineyard, Block Island, and the Elizabeth Islands nearly every weekend. Lucky dog! Thanks to both of you, for keeping Harry safe and making him available to us - and for the good work you do.